Cambusbarron Flowers has a wide selection of beautiful floral bouquets and arrangements that will be sure to brighten your friends and loved ones day. We have several different designs and styles of floral arrangement to choose from on our website, however, if you cannot find what you would like or have something specific in mind then our dedicated Florists in Cambusbarron will be delighted to make up a bouquet to your specifications. 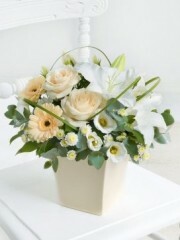 Our bespoke service is great if you wish to create something a bit more personal or unique, or if your recipient has a favourite flower or colour, you can specify the variety, colour and size of flowers that will be included in your arrangement and our expert florists will try hard to ensure that it is as gorgeous as you imagined. We have flowers for every occasion, whether it is a birthday, anniversary, get well soon, thank you or just to treat that special someone. Cambusbarron Florists also have an extensive wedding collection and can provide the bride with a stunning bridal bouquet as well as floral wedding arrangements and beautiful corsages and buttonholes for the wedding party. We have such a wide variety of flowers that you can rest assured that you will find something suitable for your event or occasion. Our Florists in Cambusbarron love to create new and beautiful flower bouquets and arrangements as they have a passion and flair for with floral design that is unparalleled. Flowers Cambusbarron take pride in knowing that we provide the highest quality and freshest flowers available and to guarantee this we import all of our flowers directly from their site of cultivation in Holland. Dutch flowers truly are the best and freshest flowers, so your recipient will have long lasting flowers that will bring them joy for as long as poissible. Florists Cambusbarron offer an array of bespoke gifts which are perfect to complete your order and make your recipient feel extra special, or they can be sent by themselves. We have a selection of champagnes and wines which are perfect for those times when you wish to celebrate, whether it is an engagement, new job, or graduation. We also have chocolates, balloons and teddies which are great to send for birthdays, the arrival of a new baby or as a romantic gift. There are fruit baskets available for when your friends are feeling under the weather which will really help to brighten their day. All of your gifts can be delivered at the same time as your flowers and you can get everything you need from Cambusbarron Flowers hassle free, so that you don’t have to visit several different stores. Our delivery service runs from Monday to Saturday and you can specify whether you would like morning or afternoon delivery from before 1pm and after to make it as convenient as possible for you and your recipient. 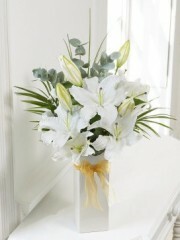 We are also delighted to offer a Same Day Delivery service for those unexpected occasions, as long as you place the order before 3pm so that our wonderful florists have enough time to ensure that every detail of your order is perfect and also to give our delivery drivers ample time to deliver your flowers and gifts in a careful manner straight to your recipient’s door in the best condition possible. Our top priority here at Cambusbarron Florists is customer service and we will try our very hardest to help you in any way we can, so please do not hesitate to contact us today if you have any questions or queries and one of our expert florists will be on hand to help in any way possible.